I received a copy of this book for my stop on the blog tour at Donnie Darko Girl. 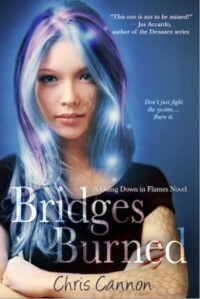 Getting ready to read Bridges Burned gave me an excuse to re-read the first book, Going Down in Flames, and I'm so glad I did. I really didn't need an excuse to read it again though - GDiF was just as awesome the second time around! Bryn is the kind of heroine you don't soon forget. In case you haven't read GDiF yet, I've done my best to make sure not to include any spoilers. A couple of things stood out to me right away. It's interesting when an author can subtly shift your opinion of a character and even more so when it's achieved with multiple characters. That's exactly what Chris Cannon did in Bridges Burned. I found myself starting to feel differently about some of the characters than I had in GDiF, and it was surprising because I never would have thought my opinions could change that way. I'm also super jealous that dragons can eat as much as they want without gaining weight. Like SUPER jealous. And it can be anything, even food that isn't good for you. Bryn could eat three or four pieces of cake after dinner! How can anyone not be jealous of that! Like in the first book, I felt Zavien, the black dragon who is kind of Bryn's protector, is a jerk. I don't get his appeal. I can see it, I just don't get it. Nola, a black dragon and Zavien's friend, becomes super needy this time around, and of course he runs to her rescue at the drop of a hat. I was sad to see Bryn get left behind over and over. I always liked Valmont, Bryn's literal knight in shining armor, and it was cool to get to know him and his backstory. He works at an Italian restaurant near the school in Dragon's Bluff. Bryn brought out the knight in him, so he really does protect her. There were definite sparks flying between them, and I think he's much more noble and caring than Zavien. There was a lot of story around Bryn and her love life, which definitely kept me turning the pages. But I was also eager to delve into the politics of the Directorate and the ways in which Bryn could really shake things up. With conspiracy theories and the mystery of who would have gained what from trying to kill her, there was plenty of action and suspense to keep me reading straight through. I love this series! Chris Cannon delivers once again with a heart-pounding and action-filled story with romance and heart.